Toys for Rabbits: Experienced rabbit owner explains why toys may be good for your rabbits and offers advice on buying or making your own rabbit toys. The star rabbit of the 2010 ARBA Rabbit Convention in Indianapolis was an English Angora with a ring of baby keys, which he threw repeatedly into his water dish. The resulting splashes nailed the passersby, who then paid him some very complimentary attention. Who would expect a show-diva to be such a clown? That rabbit had more repeat visitors, and people dragging their friends to see it than any other rabbit on the aisle. Whether you own a pet rabbit or raise livestock or wool rabbits, consider these eight suggestions about toys for rabbits. Perhaps your own rabbits will enjoy them. Rabbits like to make noise and have fun. Throwing things around the cage can show displeasure - "you need to hurry up with those pellets, human!" But raising cain with the toys also relieves boredom and helps satisfy does' hormonal needs to rearrange the furniture. Think clean empty tuna cans, or small plastic water bottles, even melamine tea cups. On the other hand, tuna cans have a lip that the rabbits can grab with their teeth and then throw them around making a lot of noise, something rabbits love to do. But if you can imagine a whole jailhouse full of inmates rattling their metal cups against the bars of their cells during a riot, you almost have what the rabbit shed sounds like at breakfast time. Toys for rabbits are temporary, and therefore, toys from the pet store likely cost too much. They will get chewed on, peed on, and eventually ignored, so don't spend a fortune. Instead, you can fill a plastic bag full of baby rattle-type toys at Good Will for $3.00. Large toddler-sized legos are generally a hit, plus plastic keys, teething rings, and rattles. Don't get things with small easily chewed parts. Remember, light weight, sturdy and noisy are the goals here. Be careful with those rabbits that are especially prone to chewing: if there are edges to the plastic they may get chewed. If the rabbit starts treating the plastic like filet mignon, replace it with something wooden. I’ve had to take the Legos away from some of my rabbits. Rabbits benefit from some exercise. The easiest way to do this is cut a piece of 2X4 the depth of their cage and place it on edge between the food bowl and the water bowl so they have to hop over it to get from one to the other. 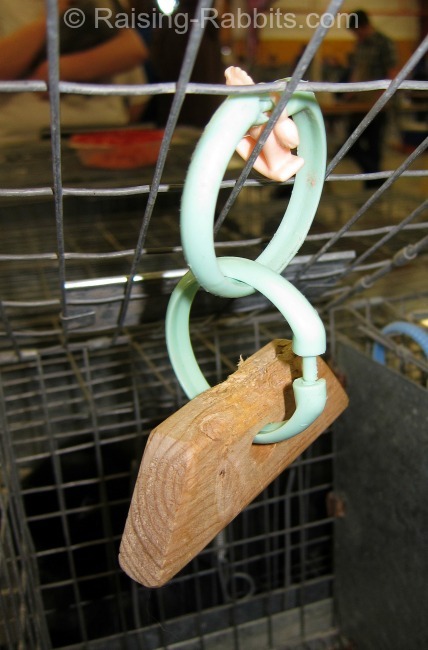 (I suppose you could fasten it to the cage with a fence staple, but it will eventually need to be removed depending on chewing and urine absorption.) I also dangle treats from the top of the cage, like fresh greens, so they have to "stand up" to get them. Rabbit toy sharing is just one more way to foster rabbit introductions between two pet rabbits unfamiliar with each other, or a breeding buck and doe before they actually meet. Think of it like an on-line dating service and/or the trading of e-mail. Each rabbit will have marked its toys by “chinning,” leaving their unique odors on the toys. Upon introduction of the doe to the buck she will immediately recognize the handsome fellow and be willing, theoretically, to accept his mating advances. Toys for rabbits are optional. It’s fine to allow a rabbit to lie in its cage all day with nothing but pellets if you want to. Really. Rabbits have gotten along like that for hundreds of years. Livestock meat production is a legitimate use of rabbits. Turning them into pets would be counter-productive if you are responsible for their eventual processing. Still, a little cage enrichment and common sense might help high strung rabbits be less neurotic, like Tans maybe, or Brits. Suspend a hairclip from the top of the cage. Place hay in the hair clip for the rabbit to nibble. Toys for rabbits can be "mass produced." Get a bag and collect pine cones. Five minutes - 45 toys. Get an 8 foot long 2X2 and cut it into two inch squares. Depending on how well you use power tools and how OCD you get about measuring, you could have around 45 toys in a half hour or less. Ask a carpet dealer for empty cardboard rolls (from the center of the carpets) and cut them into 6 inch chunks. These make great tunnels and a place to flop down and rest. Note: Because eating Ponderosa pine needles can cause miscarriages, it would probably be wise to not give pine cone toys to brood does. Toys are fun for YOU. 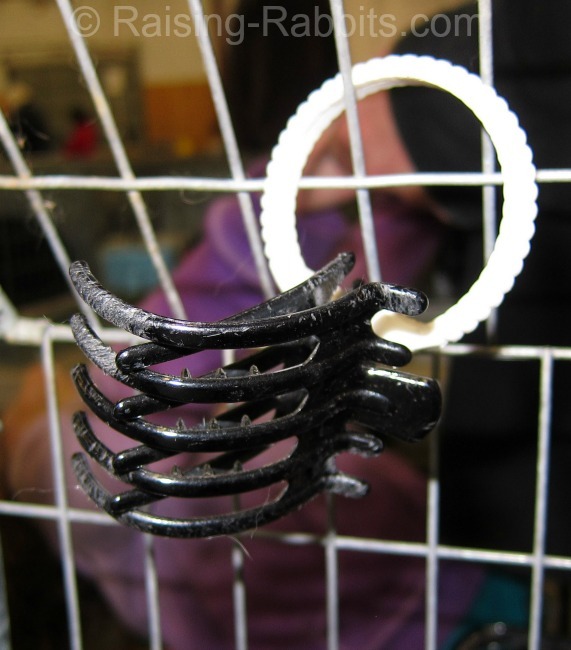 Making them gives you a chance to be creative and interact with your rabbits. But if this doesn't mesh with your goals for raising rabbits, then it's okay - don't bother. My hope is that you enjoy the time you spend with your rabbits, whether it's spent grooming, feeding, or cleaning the trays. I personally feel great satisfaction when I've restored order to the shed and all the rabbits are flopped out or munching feed. Even if the rest of my day is hectic, at least my rabbit world is in order. Kim Martin, an Indiana rabbit breeder, raises Angora rabbits for their wool, which is harvested regularly at no harm to the rabbit. As she enriches the lives of her rabbits with toys, she also enriches their diets with her own formula of high-fiber Bunny Bran Branola. This helps prevent fur block, and the added oils improve the quality and density of the fur.